Worcester's England centre Ben Te'o has ended speculation over his future by insisting that he will "definitely" remain at Sixways next season. The New Zealand-born rugby league convert, 30, has played infrequently this season after joining from Irish side Leinster in the summer of 2016. He has suffered two separate concussion injuries, added to his England calls. "It's been a little bit disjointed but I want to finish the season strongly," Te'o told BBC Hereford & Worcester. "I am definitely here for next season. I am flying the Worcester flag. "I know guys like Tom Wood, Dylan Hartley and Matt Mullan were at Worcester previously. Unfortunately, they felt the need to leave. But, fingers crossed, it's not going to be the case in the future. "I haven't even thought about it. If there are people out there thinking that (he is leaving), that's not the case." 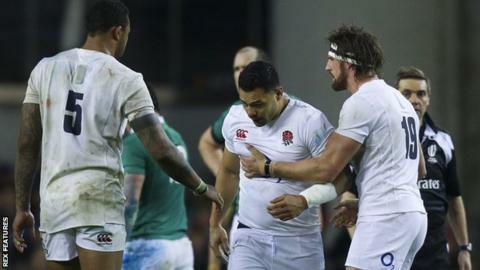 Te'o, who was signed in December 2015 by then Warriors boss Dean Ryan on a one-season contract, has played in more international games for England this season (eight) than Premiership matches for Worcester (six). He has scored four tries in his eight appearances for Worcester in all competitions, plus two Six Nations tries for England against France and Italy. And, having been recalled for Friday's game at Sale, Te'o wants to be part of completing the job of ensuring safety for Warriors, who are nine points above bottom club Bristol with just four matches left. Where is Te'o's best position? Te'o, who has made six of his seven starts for Worcester at inside centre, said: "I see myself in the long term as a 12 because of the way I am built and what I am good at. "A lot of things I am good at suits a 12 but I have also played a lot of 13. People like to talk about the two positions as a lot different but they are quite similar. We often play both roles." Warriors' options in the number 12 shirt next season may hinge on where they opt to play Ryan Mills, boss Gary Gold having stated that the 24-year-old's preferred role is also at inside centre. "Ryan is predominantly a 12 and wants to play 12," said Gold. "We want him at the club and want him to stay. "It means we need to go out and find someone to replace him as a 10 or have another back-up as a 10." If Mills were to leave when his contract expires at the end of the season, one option could be 66-times capped South Africa international Morne Steyn, who plays for French club Stade Francais. "He would be one of the players we would look at," said Gold. "We are in the market for a world-class 10 and he would certainly be somebody we would look at. "My understanding is he is under contract. It's a position we haven't denied we are looking at."